With all of the snowfall happening in Big Bear it’s been tempting us for weeks to get up there and enjoy some of that winter weather. It began as a one-rig day trip adventure as my roommate and I (Phil Convissor) rolled out of San Diego at around 6 AM. We had a jump on the Saturday traffic so it made for a quick and easy ride to the mountain. As we were driving up the CA-38 about 30 minutes out of Redlands, we stopped on one of the turnouts and to take in the view. It was absolutely jaw-dropping to see the mountains as the clouds and fog just rolled over them. 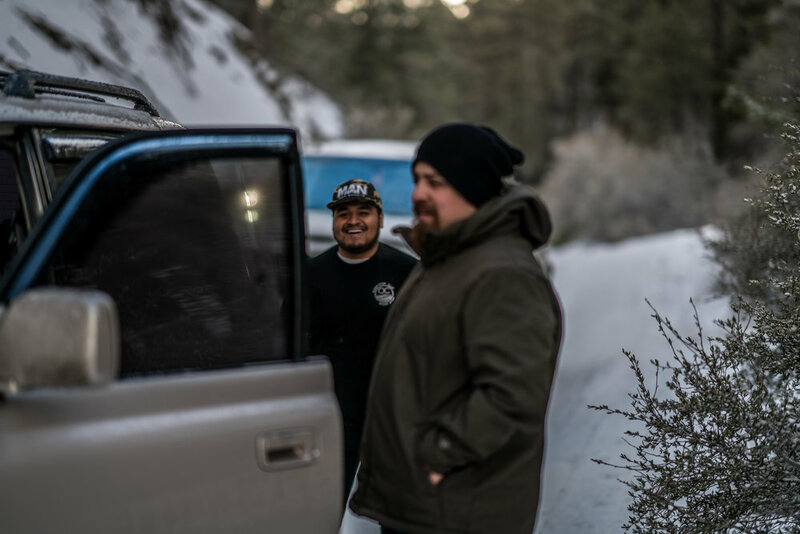 After a short pause in our drive we continued up the CA-38 and after about 10 minutes of driving up we were greeted by a line of vehicles putting on their snow chains to get the rest of the way up mountain safely. Having been here before, we knew that chains weren’t required of 4x4 vehicles but they were recommended so we continued up without them. Black ice covered the roads so the traffic flow was quite slow. We had plans to meet up with some other OCO members from the forum at 12:30 PM so by the time we got to Clarks Grade we had about three and a half hours to get through this trail and stop for a lunch break. Well, that didn’t quite go as planned… LOL. We aired down the tires before entering the trail because we didn’t really know what we’d be rolling into so I just thought, “better safe than sorry”. Then we began making our way up. As we were driving up Clarks Grade we had learned that a portion of it leading up to the village had been shut down to preserve the trail. Now, the way up there was a little dangerous because the trails were slick with clay-like mud, so we couldn’t really turn around without risking vehicle damage.. we’d have no control of the vehicle and just slide right down the mountain. Our only option after that was to take a left turn onto Seven Oaks Road. We had to continue going up and around to get back to where we had started since the rest of Clarks Grade was closed. Now, the detour we had to make wasn’t quick and easy like we had hoped it was going to be. It ended up being a muddy and slippery challenge and took us over an hour to get out of. The trail leading up the mountain was very rutted and very slippery. If you tried to pick a line to move up you’d just slide into the rut. So we only had one option, really: Ride the ruts the whole way and pray I didn’t come out of this trail with vehicle damage, or my worst fear on this trail, popping a bead and having to change a tire up here. I thought going up the mountain like this was pretty sketchy, as we went up the trail began to dry. I knew it wasn’t going to last though. And I was right. It was like a slip-and-slide the whole way. A little nerve wracking but I trusted my vehicle and my judgement to get us off this trail safely. NOTE - Something to take away from this: If you’re driving in groups, make sure to have adequate spacing between each vehicle in case one loses control. We don’t want to be bunched up on any trail, let alone in times like this where you can lose control so easily. 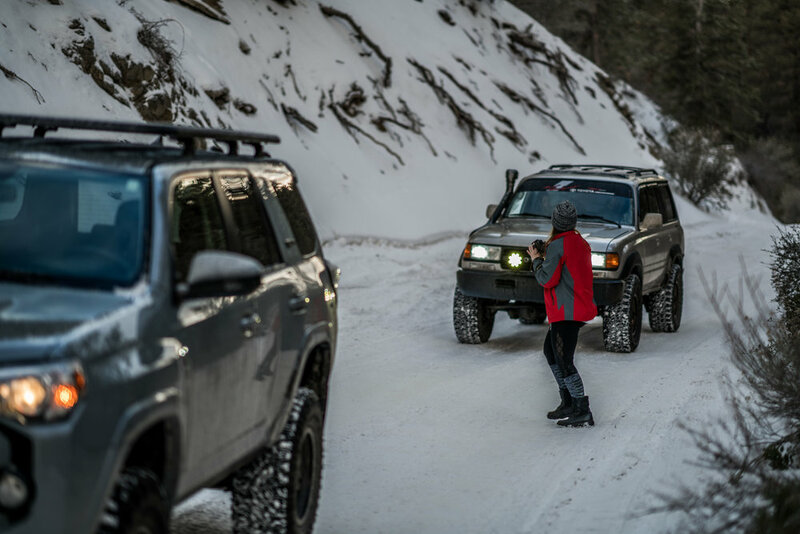 Before making your way up or down slick areas like this, hop out of the vehicle and walk up the trail to make sure the it is clear and safe up ahead, and that nobody is coming up or down. Eventually we made it back down to the paved road. By this time our hunger had set in. Out of excitement we had forgotten our food at home so we had to go into the village for food. It was about a 20 mile drive into town and we were starving so we kept the tires aired down and began our drive. Half way there we had finally decided on a place to eat. We were craving pizza so we stopped at a small place called No Name Pizza. We got out of the vehicle and stomped all the mud off of our boots and proceeded in. Well, it was an hour wait for a pizza so that didn’t end up working out for us. At this point we’re starving so we settled for some Jersey Mikes just down the road lol. The group we were planning on meeting up with in the afternoon ended up getting caught up in traffic so we had a little extra time to fill up our stomachs and hang out. After eating we still had about 45 minutes until the group showed up. So we went to the meet up point on Polique Canyon Road. When we got there we had time to map out the rest of our trail run and then relax until the rest of the guys and gals got there. 2:30 PM comes around and the rest of the crew comes rolling in. 5 rigs in total. 2 4Runners, WRX Hatchback, FJ80, and a Tundra. 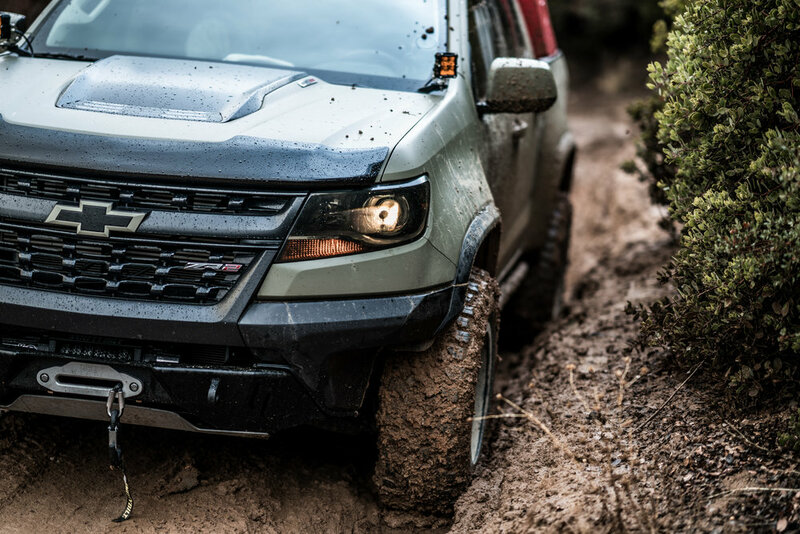 All pretty capable rigs for what should be an easy trail. I greeted the group, we chatted for a brief moment about the trail run and began our way up. At first the trail was really easy. Not too slippery, minor bumps in the road, and little traffic. About a half mile up we hit our first hill where some of the crew decided to air down their tires and we all went up one at a time. Once at the top we’d take a break and socialize with the others made their way up. Moving forward the trail was still pretty easy. Having fun moving safely as a group up the trails, taking in the view and enjoying the ride. I was ahead of the pack enough to be able to warn them if any dangerous obstacles were to arrive, and luckily so. We were coming down a seemingly easy hill until I turn around the corner, still going down, and see 2 other vehicles at the bottom waving me to stop immediately. I came to a slow stop, as to not lock up the brakes and slide out of control down into the others. After stopping I put the truck in park and waved down the rest of the crew about a hundreds yards behind me to stop. They had stopped and I told them of the situation below and then went down to talk to the vehicles stopped at the way bottom. They had told me that they were trying to come up the hill but couldn’t make it and kept sliding back down. They were now trying to turn around and go back the way they came. They had also told me that vehicles passing by prior to us have gone down not realizing how icy it was and gotten into collisions with others and the trees. Now we were in a predicament.. Either try to turn around and go back up, or let these vehicles clear the area and then we go down. Well, the last two vehicles in the group (Tundra and 4Runner) were able to successfully turn around and make it back up the hill. The others, however, when trying to back up would lose control and begin sliding farther down the hill. After a short while we finally decided the safest route off of this trail, for the ones still facing downhill, was to continue downhill and finish the trail. I understood that this wasn’t what everybody had planned for and maybe a little more out of their league compare to what they’re used to. Not many people have faced driving in icy conditions like this before. I ended up being able to perch myself up on a bank on the side of the trail just in case anybody’s vehicle were to slide down and to prep myself for being in a position to go back up should we all decide. But since we decided to go down the rest of the hill I would be the first one to go down. As I went down, I pointed the truck straight down the hill and let it go. I had no use of brakes at this point so I just kept the wheels spinning on the ground so the truck didn’t slide out of control. I made it down safely and moved the truck far enough ahead to where it would be out of the way of others. After I parked it I ran back up and assisted the others in making it down safely. We all made it with little to no issues. By this time though it was already dark and we had only one way out with many miles of trail ahead of us. Thankfully, though, we had Brandon leading the way with all of his lights. and me trailing. The rest of the trail was really mild with the only obstacles being muddy puddles and bumps in the road. We finally reached the end of the trail around 8:30 PM and it was time to air up. Typically I would use my portable air pump that you just connect to the vehicle battery under the hood, but Brandon had pulled out his Power Tank and asked if I’d rather us that. Now, these things have a reputation for filling up tires quickly but I didn’t realize how quickly until he started going. I swear, it took less than 10 minutes for him to fill up 4 vehicles tires, including mine. It would normally take me 15 minutes alone to fill up mine with the compressor. Finally, the end of the day has come and it’s time to start our trip home. I said my goodbyes to the crew and thanked them for the awesome time. I hadn’t planned to be on the mountain this long and I wasn’t expecting a 3 hour drive back to San Diego, but that’s exactly what it was. The roads were a little slippery from the black ice and the traffic was extremely heavy so it took us just about an hour to get down the mountain. After that it was a smooth ride with clear roads all the way back home. A few notes to take from this trip..
No matter what the conditions are, it’s always good to be mindful on what lies on the trail ahead. If we hadn’t been cautious of others down the hill I could have lost control, collided and possibly injured somebody. Be mindful of others and never drive reckless. Mind your spacing. Especially in conditions like these, it is important to maintain an adequate distance in front and behind a vehicle. If spacing had been too close then we could have collided into each other. There are many more notes to take away from this trail run, but the last one I’d like to make is to always maintain a positive attitude. Sometimes when we get in rough situations it’s easy to tense up and stress out. But it’s vital that you buckle down and handle it the way you would any situation in life. Maintaining a positive attitude will keep you thinking clearly and your judgement sound. Thank you so much for taking the time to read about our trip to Big Bear last Saturday. I look forward to telling you more about the trail runs we make in the future.